A Hole-in-One, a brand new trophy and then three pairings scoring 46pts each to share the spoils for one of the main weekend awards. These were the highlights of the Inter-Company golf tournament in Hardelot which saw the newly named dmg media team who replaced the former Associated Newspapers winning team of last year, taking the top prize in the competition after one of the closest finishes ever. There were six teams fighting it out over the Dunes and Pines courses with new boys on the block Evenbase the unknown factor and the Daily Mail hoping to gain back the infamous Wooden Spoon from last year’s winners the Mail on Sunday. After the first round of the competition it was virtually impossible to say who would end up as the winner of the main Viscount Rothermere Trophy with just five points separating all the teams. dmg media were leading from the MoS with the Chairman’s team just behind in third place, closely followed by UKMetro and the Daily Mail with Evenbase one point behind in last place. Everything was then going to change after some serious motivational talks by the Captains and team bonding at the evening meal. There was much banter and laughter as the results of the first round were read out and players realised that everything could turn on just a couple of good wins while Daily Mail Captain Geoff Levy and his golfing mentor Guy Zitter rallied their players with the need to do everything possible to make sure they took home their prized possession of the Wooden Spoon. Maybe the surprise of the first round was the four points scored by Evenbase who threatened snatching the Wooden Spoon from the Daily Mail, but Captain Mike Wall who is normally in the winner’s enclosure knew how to rally his team and they turned their form around on the second day. Never having had a hole-in-one, dmg media’s Mike Wood took out his trusty nine-iron on the 125 yard 17th hole on the Dunes course and saw his ball land safely on the green to roll straight into the cup. He celebrated in true Hole-on-One tradition later back at the Hotel du Parc by putting a couple of bottles of fine scotch on the bar for everyone to have a drink on his success … and his Hole-in-One scored his partnership five stableford points to help them win their match. “It’s a wonderful feeling especially as I have never had one before. So many great players have never had one and then it happens just out of the blue and I’ll remember this forever, particular on this great weekend,” he said. The Harmsworth-Mullchrone trophy is awarded on the first day of the competition to the pair scoring the highest stableford points and normally this is won by just one of the pairings. This year there were three pairings all scoring 46pts and amazingly, two of these were playing against each other so their match was halved! In 1910 the Northcliffe Golfing Society was formed by the founder of the Daily Mail, Lord Northcliffe, who was instrumental in popularising the game of golf nationwide through the columns of his newspaper. He employed one of the best professional golfers of the era, Abe Mitchell who later went on to be immortalised as the figure on the top of the Ryder Cup, having gone on to help set up the competition while working with Sam Ryder after the death of Lord Northcliffe. For years the Northcliffe has awarded trophies at Society events commemorating Lord Northcliffe; former main board directors of the newspaper group; Editors of the paper and its famous journalists, but there has never been an Abe Mitchell award. This year, however, a new Abe Mitchell trophy was presented for the first time having been donated by the Society’s secretary, Garth Burden, who tracked down an old Abe Mitchell hickory shafted driver with Abe’s name on it. Abe was a significant part of Lord Northcliffe’s golfing career and is remembered for his time at North Foreland Golf Club, the course developed by Lord Northcliffe. The new trophy will now join the Society’s display in the glass fronted cabinet in Northcliffe House and will be presented annually at the Inter-Company to mark good quality golf played during the year by a member who may not necessarily be winning other trophies. 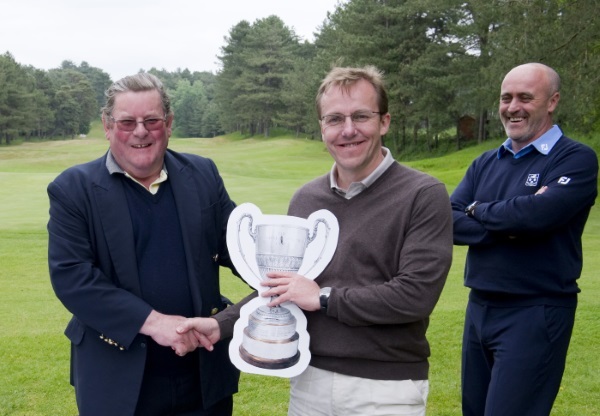 The inaugural winner of the Abe Mitchell trophy was Clive Heard, from dmg media accounts department, an eight handicapper and the presentation was made by Society Chairman, Vyvyan Harmsworth who, as Captain of the Chairman’s team, was representing the Society’s President Lord Rothermere who was unable to attend the weekend tournament. “Being awarded the Abe Mitchell trophy was a complete but very welcome surprise and I’m still a little shocked to have been the very first recipient,” Clive said. Commenting on the overall success in the weekend competition of the dmg media team he added “I think the key to our team’s success lies not in the careful team pairing calculations, or the drafting in of highly talented golfers from the far flung corners of the company, but in the very strict, pre-tournament, alarm clock training that each of our members have to undergo prior to being offered a place. “Also, not forgetting the slightly underhand tactics of having a team member ace a hole as an excuse to ply all of the opposition with copious amounts of extremely potent whisky in the run up to the 2nd day’s competition. It was one win more than the Mail on Sunday on the first day that was enough to give the dmg media team the Associated Newspapers Cup and this was presented to Captain Graham Brown who held aloft the replica of the actual trophy to loud cheering from his team. Because of insurance costs and possible damage to the very old and irreplaceable trophies, replicas are always presented although the winning team names are later inscribed on the real trophies. There were two other main awards at the first nights prize-giving. The Ian Wooldridge Centenary Trophy to mark Corinthian fair play was awarded to the keeper of the Society’s handicap records, Ian McGowan from dmg media and the JAK trophy for the most enthusiastic golfer was awarded to the Daily Mail’s David Crump. Earlier in the day players took part in the Lady Rothermere charity putting competition that raised £360 and it was a Chairman’s team player, Duncan Powell, based in America, who won the champagne for his 33 putts around the 18 holes, laid out around the Dunes putting green. Each year the Daily Mail cartoonist MAC donates a unique cartoon to the Society for the golf weekend and this is raffled for the Society’s funds. This year’s lucky winner of the framed original cartoon was Matthew Ford from dmg media. With everything to play for on the second day of the competition there were again very close finishes to most of the matches with so many ending only on the 18th green. Once again it was the dmg media team who lead the way and not only shared the Arthur Fuller Cup for the team with the most match play wins with both Mike Wall’s Evenbase and the Chairman’s team, but took the weekend’s main honour of the Viscount Rothermere Cup. The other main trophy on the second day, The Vere Harmsworth Challenge Cup for the pair with the biggest match play win was won by the Chairman’s team pairing of Janet Lee and Keith Burkin with a 6/5 victory. The Wooden Spoon, so coveted by the Daily Mail team that a special, solid silver version was presented to the Society by Mail Newspapers Managing Director, Guy Zitter, to mark the number of times his team has won it, was won back by the Daily Mail from last year’s winner, the Mail on Sunday. Captain, Geoff Levy, accompanied by Guy, beamed with delight as he held it above his head to loud cheering. All teams agreed, however, that it was the fun and laughter of the weekend that was the real winner, and, as in previous years, the golfers were joined by the Northcliffe Tennis Society who organised competitions and coaching on the Hotel’s courts. Everyone said that the weekend format was a tremendous success with both golfers and tennis players joining up for the meals and prize presentations. Over £3,360 was raised towards Society Funds from the raffle, Back the Winner contest and other money raising ventures which help to subsidise future Society golf days. There was a total of £620 invested on the Sweepstake and “Back the Winner” with dividends as follows. Four entries correctly forecast the finishing order of the top three teams. Keith Cottington; John Morgan and both the Daily Mail and Mail on Sunday group entries all won £38.75p each out of the £155 kitty. There were seven correct entries in Sunday’s sweepstake on the Stableford competition. Barry Theobald; Graham Brown; Peter Durham; Keith Burkin; Ian McIlgorm; John Morgan and Keith Cottington all won £22 each out of the £155 kitty and there were five winners of the Monday Matchplay sweepstake. Geoff Levy; Garth Burden; Vyvyan Harmsworth; and both the Daily Mail and Mail on Sunday group entries all won £31 each out of the £155 kitty. The Society received a quarter of the overall pool which raised £155 towards funds. Viscount Rothermere Cup – Overall winning team – dmg media 17pts. Harmsworth/Mulchrone Trophy. (Sunday) – Pair with Highest Stableford Points. Brad Young and Nick Greenslade, Daily Mail, with Matthew Ford and Chris Underhill, dmg media in the same match and Keith Cottington and Peter Durham, dmg media, all 46pts. Associated Newspapers Cup. (Sunday) – Team with the most stableford wins – dmg media. Arthur Fuller Cup (Monday) – Team with the most match play wins. Shared three ways between Chairman’s team, Evenbase and dmg media. Vere Harmsworth Challenge Cup (Monday) – Pair with Biggest Match Play Win. Janet Lee and Keith Burkin, Chairman’s team with their 6/5 victory. JAK Champagne Trophy for the Most Enthusiastic Golfer. David Crump, Daily Mail. Ian Wooldridge Centenary Trophy. Ian McGowan. dmg media. Vyvyan Harmsworth (2nd); Metro’s Ross Thomson (5th); Chairman’s Keith Burkin (7th); Daily Mail’s Dan Hyde (11th); Evenbase John Frith (14th) and Mike Wood for his Hole in One on the 17th. Clive Heard (5th); Mail on Sunday’s Laurie Brannan (7th); dmg media’s John Tucker 12th; Chairman’s Alan Jackson (14th) and Dan Hyde again on the 17th.